Scott Meyer’s Magic 2.0 series is fantasy with a science-fiction hook: a computer hacker named Martin discovers an all-powerful file that lets him control reality, so he travels back to medieval times and pretends he is a wizard. This fails spectacularly when he meets all the other hackers who had the same idea. 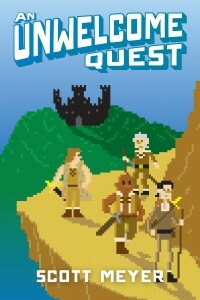 An Unwelcome Quest is the third book in the series. The first two weren’t perfect by any means, but they were at least funny and light on their feet where this one quickly wears out its welcome. It’s a huge shame, because this series was exactly what I was looking for when I wanted to have a few laughs during my commute. One definite bright side is that Luke Daniels continues to bring his A-game as narrator. Also, I occasionally enjoyed the last quarter or so after gritting my teeth and slogging through the fairly dire middle. I think the only reasons I made it through this installment in the series are because I wanted to know what happened to the characters and the fact that I received a review copy. Unfortunately, one of the first big changes in An Unwelcome Quest is that the events take place almost entirely in the magical world instead of jumping back and forth between modern times and the past. This means that treasury agents Murph and Miller don’t even appear during the story. Their presence is sorely missed. Meyer also splits up his cast of heroes into two groups, with Martin – the main character in the earlier books – relegated to a supporting role in an ensemble. The book opens with Todd, a psychotic ex-wizard, escaping from prison. He kidnaps half of the characters and forces them to run through a badly designed RPG campaign. When Martin and the remaining wizards realize their friends are missing, they rush to the rescue and run through the same campaign in slightly different ways. Both sets of wizards bicker endlessly at every turn, and the effect is more sour than funny. It doesn’t help that Meyer includes constant explanations and recaps at every turn, in case you weren’t paying attention during the previous chapter. This repeats ad nauseam. There is also a running joke that all the enemies in the game have the same basic attack pattern, which does nothing but undermine the already very low stakes. In fact, the villain explicitly tells the wizards that the obstacles they face will only annoy them without actually killing them until they reach the climax. That final sequence is basically the only part of the book where it feels like the characters are in even mild danger. In the end, An Unwelcome Quest feels like an over-padded novella. There are entertaining moments here and there, and I did actually laugh out loud a few times. Unfortunately, getting to those good parts required slogging through a lot of tedium and redundancy. I might be willing to read another book in this series if Meyer somehow course-corrects, but it’ll take some pretty glowing reviews to convince me. Full disclosure: I received a free review copy of this book from NetGalley. Of course, I ended up going ahead and buying the audiobook version because Luke Daniels is a fantastic narrator.